You usually need to take notes for a meeting, whether it’s about tracking attendees, remembering what was discussed, or listing action items. If you use OneNote, Skype for Business lets you take private notes or add shared notes that you can co-edit with participants. You can also add notes to the meeting request if you use Outlook, or while you’re in the meeting room. Note: You must have OneNote installed to add notes to a Skype for Business meeting. If OneNote isn't installed, you might get an error when you try to add notes to a meeting. Get OneNote for free. Share notes with the meeting lets you add shared notes to the meeting request. Your invitees can then click View Meeting Notes in the meeting request to open them in OneNote to view or edit. Take notes on your own lets you add your private, personal notes to the meeting that aren’t visible to others. For information about setting up Skype for Business Meetings, see Set up a Skype for Business meeting in Outlook. 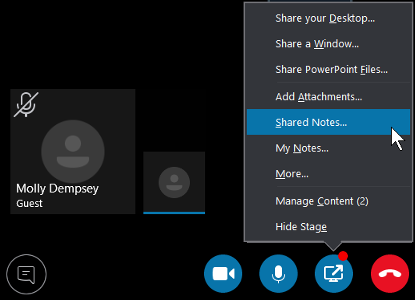 In the meeting window, click the Share Content button. Click Shared Notes to choose a note that participants can view and edit. The note you select appears on your desktop and participants receive an notification in the meeting to open the note. Click My Notes to take private notes on your computer. The note you select appears on your desktop. 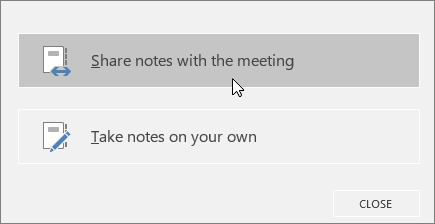 Shared notes need to be in a location that other people can get to, like OneDrive or SharePoint, and people need to have permission to open and edit them. When you open the note picker, you can only see shared notebooks that were previously opened on your computer.